One of the great Ethiopian authors and statesman of this century, Haddis Alemayehu was born on his day, October 17. If he had been alive, he would have turned 99 today. Born in the Debre Markos district of Gojam province on October 17 1010, Haddis grew up with his mother,Desta Alemu, as his father, Alemayehu Solomon, worked away from home as priest and took another wife. He had begun school in traditional poetry which went up to the level of Zema-chants at home under his maternal grandfather. He then proceeded to Debre Gennet Elyas, thence to Debrework and finally to Dima Giorgis where he graduated in qene.Haddis then attended several schools in Addis Ababa, including the Swedish Mission School(1925-1927), Teferi Mekonen School, and Ecole Imperial Menelik II. He wrote his first play during this period, “Ye Abesha en ye wedewhula gabcha” (The Marriage of Habesha and the Backward) which displayed remarakably mature style.It tells about the marriage of the woman Ethiopia(Habesha) and her children by her husband, the Backward One.Her children think only of thier own pleasure, not about Ethiopia’s well-being, and therefore the glory and greatness of Ethiopia suffer and decay; she becomes poor and ill, she gets an eye disease so that she canot see well, and she lives in misery.Ethiopia tells her son and dughters that it is thier attitude that has led her tp present misfortune.Then Haile Selassie, her latest son, is born, and he changes the state of affairs;he leads the famikly to prosperity and well being, and his mother Ethiopia gets proper treatment and gets well again, and her eyesight is restored. The play was written for a school performance, but staged in the Majestic Hotel in Addis Ababa.He also composed the songs for the play. This and another play, staged at Crown Prince Asfaw Wosen Haile Selassie’s wedding in May 1932, made him noticed by many prominent personas, including the newly crowned Emperoe Haile Selassie I. In the early 1930’s, Haddis returned to Gojam, where he worked as a customs clerk and school headmaster before moving to a teaching position at Debre Markos. Haddis fought during the Italian-Ethiopian war (1935-1936) until he was captured and sent to the island of Ponzo in the Western Mediterranean and then to the island Lipari, near Sardinia. Freed by allied forces, Haddis returned to Ethiopia (1943). After brief stints In the Department of Press and Propaganda and Ministry of Foreign Affairs, he became the Ethiopian consul in Jerusalem (1945-1946) where he stayed for about two years there. There he met and married Kibebe-Tsehay Belay, who lived and had been brought up in Jerusalem. Haddis then served as a delegate to the international Telecommunications Conference in Atlantic City, New Jersey (1946).Afterwards, he relieved a posting to the Ethiopian Mission in Washington, D.C. and at the United Nations (1946-1950).His next assignment was at the Ethiopian Ministry of Foreign Affairs(1950-1960), first as director general and then as vice minister. During the 1956-1960, Haddis served as Ethiopia’s representative to the UN.Upon his return to Ethiopia, Haddis briefly worked as minister of education (1960) followed by appointment as ambassador to Britain and the Netherlands (1960-1965). After his recall to Ethiopia, Haddis, who was not in good health, preferred not to reenter government service. Reluctantly, he agreed to become minister of planning and development (1965-1966) and also served in the Ethiopian Senate91968-1974). During the first two years of the Derg regime, Haddis served as a member of the “advisory body” that had been created to replace the dissolved parliament. However he declined the Derg’s offer t become prime minister, thus removing himself from any meaningful role in government. In the meantime, he had revived his literary career. In the 1965, he published Fikir Eske Mekabir, his most famous novel, about love in feudal Ethiopia.He started it in Washington when he was First Secretary at the Ethiopian Embassy there. It was written over a long period with many and long interruptions.Afte his wife died when he was ambassador in London, he put it aside for about a year and then took it up again. The book came out in 1965 and was an immediate success, having enjoyed nine reprints to this date. In 1969 this work won the author the Haile Selassie First Prize for Amharic Literature.It has been used as set text in Amharic literature in Ethiopian secondary schools from few years after it appeared. 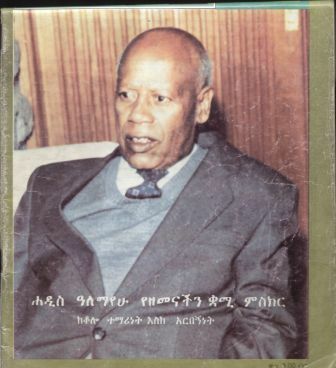 He subsequently published several other novels in Amharic. His later novels, Wonjelegnaw Dagna (The Criminal Judge) and “Yelemzat” (Sweet Only in Dreams) didn’t attract much critical attention like the first one. Chronologically Yelmzat should have proceeded his previous novel, as the time setting in this novel starts where Fikr Eske Mekabr ends after Haile Haile Selassie became Emperor and a couple of years before the Italian occupation of Ethiopia and continues to where Wendeleganw Dagna takes off-a few years after Ethiopia was liberated. The three novels form a trilogy in time, although the themes are unrelated. Each book is an independent creation and can be read without reference to the other two. Haddis also penned a political tract, “Ethiopia min aynet astedader yasfelgatal?”(What kind of governance does Ethiopia require? ).His memoir, Tezita (Remembrance) recounts the events of the 1935/36 Italian war and Haile Selassie’s subsequent seven years of detention. In 1999, Addis Ababa University awarded Haddis an honorary doctorate for his literary accomplishments. He died on 6 December 2003.Haddis died on December 7, 2003. I can’t thank you enough for your great service of keeping alive the memory of our cultural history. Keep it up. Haddis is really the pioneer of modern Ethiopian literature.He deserves great gratitude to his unreserved effort on both deplomatic mission and big creative contribution to his motherland-Ethiopia. Haddis Alemayehu was a wonderful man!!!! His name will live forever above the grave!!!! He is the Founder of Ethiopian Modern Litrature. SO, WHY DON’T WE BUILT A MEMORIAL GRAVE STONE IN THE HEART OF HIS BIRTH PLACE , OR, ATLEAST IN DEBREMARKOS????? Africans.Ethiopia should not forget such historical people because their history is a stepping stone for this generation. The generation who is Ethiopian but inside his heart always American and is ashamed to be called an Ethiopian. I am sometimes afraid that there will be generation gap. And that Ethiopian histroy will stop some were and that we will end up admiring other outsiders. Haddis Alemayehu was a wonderful man!!! !